NJDEP SRP - OCR: Community Relations General Notices: Why Yank That Tank? Community Relations General Notices Why Yank That Tank? Older storage tanks for home heating oil - whether underground, above-ground, or in the basement - can rust and leak over time and contaminate soil or ground water. This poses a number of environmental/health risks and New Jersey law requires homeowners to take prompt action to minimize those risks. Signs that a home heating oil tank is leaking can include an unexplained increase in fuel oil consumption, water in your underground storage tank, constant problems with your oil burner, staining on basement walls or floor, oil sheen in basement sump or French drain, and fuel oil odors in areas other than around the oil burner. If you have any of the signs that a heating oil tank is leaking, contact your heating system service company to rule out maintenance problems. To determine if the problems are caused by a leaking fuel oil storage tank, contact a DEP certified environmental professional. For more information regarding the Underground Heating Oil Tank program, please visit https://www.nj.gov/dep/srp/unregulatedtanks/. State grant and loan programs are available to provide financial assistance for removal and cleanup costs. For more information about the non-leaking tank fund program, please visit https://www.njeda.com/ust_funding.asp, or contact the NJEDA Customer Support Administrator at (609) 777-4898. 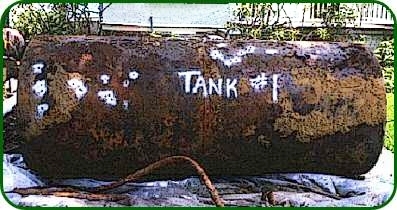 For more information about funding for cleanup costs for a leaking tank, please contact DEP Contract and Fund Management at 609-777-0101, or visit https://www.nj.gov/dep/srp/finance/ustfund/. For more information, visit https://www.nj.gov/dep/srp/community/ or call the DEP Office of Community Relations at 1-800-253-5647.